A 35 years old American photo-journalist back from a trip to Indonesia reports to hospital with acute fever and chronic lymphedema. 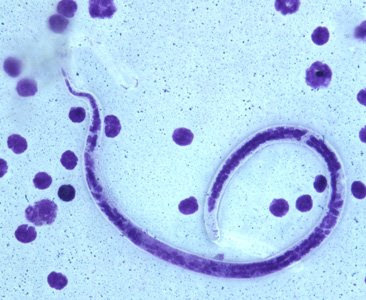 Giemsa stain of blood smears are shown below. What is your diagnosis and based on what criteria? Enter ur answers in the comments section before 02Feb09. As usual, first three correct entries will fetch you surprise 'n useful gifts ! 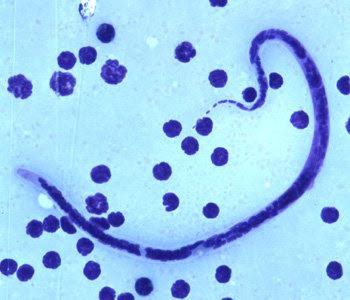 Microfilaria of Brugia timori. Hints: Its sheathed,sheath doesn't stain with Giemsa, and a larger number of single-file nuclei towards the tail.